There are lots of tutorials for cute I-Spy bags that require sewing and buying a plastic transparent sheet and measuring and . . . ug. Too much for me. Sometimes I like to be able to sit down and do a project and have it done in just a couple of minutes . . . this is one of those projects! And it is really cheap, too! First take a picture of all your little items that are going in the bag. This is the picture that I used. Also, make a list of all the items (I typed mine up). I glued my list on the backside of my picture and laminated it so that it would last longer than one day. I then quickly hand-stitched the list/picture to a piece of ribbon and then stitched the ribbon onto the pencil pouch (yikes- don’t look closely at my stitching! I was trying to hurry and finish it before church so that I could take it with us!). This way, we won’t ever lose the list of what to look for. I also liked the idea of having a picture of all the items so that my 3 year old could find things on her own, without us having to tell her every couple of seconds what item to look for next. Put your items and your poly pellets in your pencil pouch and zip it up. Then, go crazy on that zipper with the glue gun! You don’t want any little poly pellets ever falling out. Can you imagine the mess that would make??? No thank you! Want some fun file folder games? I found mine here. You can purchase them individually and print them off, or you can buy a book full of file folder games. Also, you can google “File Folder Games” and there are a couple of cute free ones out there! I just found your blog from somebody's facebook link and I just have to say you six girls are just about the greatest sisters ever! (Not including mine of course, as there are six of us girls in my family!) I love all your ideas and am going to be a faithful follower! Thanks for sharing all your grand schemes and ideas, but what I love the most is your obvious love and support of each other. You girls are great! I made a few of these bags after seeing your blog! I thought they were brilliant! Instead of using hot glue, though, I used super glue around the base of the zipper pull quite heavily & in the zipper teeth (after I zipped it of course!) & then used a handle (the white ropey looking type) from an old gift bag & tied a knot through the top grommet of the bag & super glued the knot & then again on the knot that went through the hole punched in the card. This looks looks like hours of fun! Did you read a book along with these activities? You all are featured today at Creative Juice. Thanks for linking up! Ok, LOVE LOVE LOVE LOVE LOVE this! (I like it.. can you tell?) I have had "I-spy" bag on my to-attempt list but haven't gone for it yet because I am sewing challenged. This is awesome. Thanks for stopping by my blog :) I'm a new follower, you've got some awesome stuff!!! I found your post on Pinterest and I'm LOVING this idea! I'll be gathering my supplies tomorrow and will link up with you to show it off :) Thanks! Why provide a link for her to view the same project she just beautifully made?? WOW! What a darling blog! I just thought I'd let you know that I recognized the darling I spy bag right away from seeing them on "a girl and a glue gun" blog. 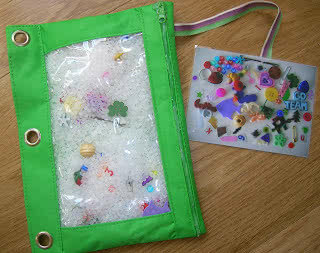 http://kimboscrafts.blogspot.com/2010/09/yes-even-more.html - I think that is the link that takes you directly there. I just found your site through another (The Grey Seeker) because I am trying to find ways to help calm my 5 yr old with anger issues. This might be fun for all and I thought, I could use a plastic mayonnaise jar to make one for home quiet time. I like to have multiples of things due to always being on the go and having 3 kids. Thanks so much for your blog! I'll be checking out more. Rice would be a much cheaper and easier way to fill the bag. Plus, rice is knowingly non-toxic, just in case the idea of getting in the bag is far more interesting than what is in the bag.